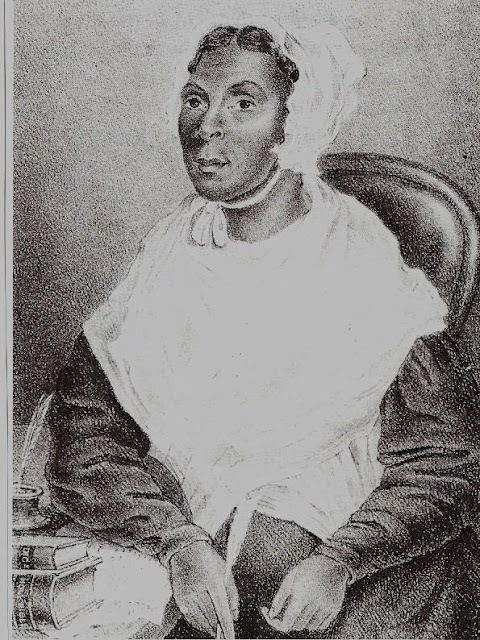 Jarena Lee was the first woman to preach under the auspices of the AME church. The child of free black parents, Lee was born in New Jersey in 1783, & worked as a servant in the home of a white family, 60 miles from her home. Strongly affected when she went to hear Richard Allen preach, Lee determined to preach herself. At first rebuffed by Allen, who said that women could not preach at the Methodist Church, Lee persisted; & 8 years after his initial refusal, Allen allowed her access to the pulpit after hearing her spontaneous exhoration during a sermon at Bethel AME Church. Lee traveled all over the United States preaching her gospel of freedom, even venturing into the South to preach to slaves. The following is a segment of her journey written in her own words. While I was in Buffalo, a journey to the West was shewed to me so plain that I could not stop in the city of Philadelphia but five weeks only, then left for the western country. I started in a mail stage, and stopped first at Westtown and spoke in our own connexion Church, and then at West Chester in the old Methodist Episcopal white connexion. We had a large congregation of quiet hearers. I felt liberty but no great displays of God's power. I had several meetings in different places, visiting the sick. Having discharged my duty I left there and proceeded on to Old Lancaster and spent some days. We have a good Church there, and great meetings - the word of the Lord grew and was multiplied. God poured out his spirit upon us, and we had a shout in the camp. I then started for Columbia, Pa. The people are much divided, and it looked very gloomy, but God directed me and he commanded his disciple to be a sheep among wolves, and harmless as doves, notwithstanding the darkness, God aided me in speaking to the people, and aided them in hearing, and his name was praised. The people united, temptations and clouds were vanished away. Then we sung, prayed, spake, and shouted in the spirit, this is true Methodism. I led class, visited the sick and was much favoured with the presence of the Lord. Our faith was increased, our hopes confirmed. The preachers were kind and treated me well, and by their help I travelled on my journey to Harrisburg. Feeling thankful for the visit I had paid it seemed gloomy here, but I spoke there next day. I took stage and rode to Chambersburg, and spent some days there, and proceeded on to Fredericktown, Maryland, and, spoke there from there to Hagerstown, Macallansburg, and I must confess, It do not remember of ever seeing such a people, for, it seemed strong drink had been their ruin. The circuit minister was there, and we had some signs and wonders to follow after the preaching of the cross of Christ, and I trust to meet some of them on the banks of deliverance, and help to swell the notes of redeeming love. After the preacher left me I took stage for Pittsburgh, at eight in the evening, rode all night until eight in the morning. I was kindly treated, there were other persons in the stage, four of them gentlemen, as I thought there was one who talked a great deal, wise in his own conceit, about religion, and from that he displayed a quantity of degraded principle, with disgusting language, at which I made several sharp replies, and in my way, reprimanded him and the other gentlemen looked on him with silent contempt, at which he got ashamed, and afterwards treated me with great politeness, and I was comfortable and arrived in Pittsburgh at 5 o'clock in the afternoon. I went to Church that night and heard a sermon from one of my brothers. I met with six or seven ministers, very friendly, and treated me like Christians. I remained in Pittsburgh six weeks, there had been one or two revivals previous to my visit, especially the winter before I arrived, last day of August, 1820. My labors commenced - the field was large - but the Lord was with us - this gaves me much encouragement, I was not ashamed of the Gospel - it is the power of God unto salvation, to every one that believes, both Jew or Gentile. We had very good meetings, the Elder and preachers, all received me with one accord - thanks to God for his divine goodness. I felt moved by the Lord to pay Wheeling a visit although we had no society there, I arrived and found but a small class of coloured people with the whites, an old gentleman of color with the elder in charge granted me the Church - the elder being a great preacher of college order. We had a large congregation; I spoke for them once, and gave an exhortation at another time, and felt no difficulty on that head, and after that they could not treat me well enough. And, on the ensuring Sabbath, I helped to lead class; and we all enjoyed ourselves, and on Tuesday I left for Washington, according as I had promised our elder before I left him. On my arrival there I met kind friends, and a large congregation of coloured people. On Lords day I met the class; the people spoke with humility - it was a melting down time - in the Spirit of God I preached several sermons, visited the sick, and, in this spirit strove to uphold the aged. Feeling a discharge of my duty I left for Steubensville, Ohio, and met a small society - some try Christians there; no Church there; the Baptists granted their Church; we had meetings there, and the Lord was with us - quiet congregations - and the word had effect in the hearts of sinners - and believers were established. I stopped a few days and left in the name of the Lord. I proceeded on to Mt. Pleasant, and arrived on seventh day evening, and the trustee gave me an appointment on Sabbath morning. At 11 o'clock I was feeble in both body and mind, but the lord was with us according to promise, think not what ye shall say, but open thy mouth and I will fill it saith the Lord, he caused a shaking among the dry bones, that morning. I think if any creature has a right to praise God I have, and that in thankfulness, and I love him because he first loved me. Bless his name. I preached several sermons to large gatherings, but revivals not so manifest as at other places. I had some difficulty in that journey, but only what is common among us; for many times deceitful persons will set the Church on fire but can't burn it up. Moses saw it as a bush in a flame, yet not consumed. We have to be tried as gold in the fire. After my visit was out a brother (leader in the Church) conveyed me ten miles on my way, I stopped at Sinclairsville; there was an appointment published on the next evening. At 7 o'clock I spoke in the Court house to a large concourse of well behaved and respectable citizens. I felt at liberty and left in peace of mind which makes the work sweet. I left in peace with God and man, and went to Barnsborough and spoke in the white Methodist Episcopal Church, from thence to Zanesville, at which place I felt much discouraged from the appearance of things. I did not think of tarrying there, but at the first appointment I chose the words "I am not ashamed of the Gospel." - Paul. The room was very small for the number of people, after which an old man well scented with ardent spirits, tried to give an exhortation. I was astonished at the scene, the people laughed I got up and went out. I tried to labor again at night and exhort the young ladies to the evil consequences of ill-behavior in the Church of God; after which we had better order, and the old gentleman was discovered to be intoxicated with spirituous liquor, and was disowned from the Church, after which there was a great revival took place among the white Methodists, both rich and poor. Mrs. Dillin, who once was a Friend, and now a member of the Church, spoke to the Trustees and Ministers, and they opened the Church and I spoke twice in that Church, and after that I spoke in west Zanesville, back of that place, and I still remained among my colored friends, and they seemed much revived; after which they formed a Resolution to build themselves a Meeting House. A Quaker Friend, so called, presented them with a piece of ground to build one on, which they did. Glory to God, for his glory stood over the doors of the Tabernacle. Many were convicted, and converted, and many added to the old Methodist Church and I left there on New-years day for New-Lancaster, where we had a haunch, standing on a frame of a house for three or four years, and had not been used to preach in; but the Lord opened the way, and a great revival took place among the people, and their eyes being opened, they with willing minds commenced and built a new Church, and god blessed their labors. I preached several Sermons and led class, &&;c. My common way is to visit the sick and afflicted in whatsoever city I may stop in, that I may get my spiritual strength renewed in the Lord. Although I preached the Gospel through the Commission of my Lord, yet I have nothing to boast of. I opened a Love-Feast in the said Church in New Lancaster. We held Prayer Meetings. I spoke in the White's Church also. The people were very friendly. I met them in Class, and after the lapse of eleven days, I left for Columbus. The Preachers generally were very kind to me. Both white and colored. A worthy brother conducted me on further. It snow'd, and I was very cold, but the Lord was with us, and my mind was free'd. But notwithstanding, I met an antagonist, who was ready to destroy my character, and the principles of the work that God saw good to make me instrumental of doing in his name, which caused me to open the case to the Trustees and Preaches, who were much astonished at him to be preaching four or five years with malice in his heart. I was favored to see him in the morning before he went away, that was the first time he had spoke to me anything like a Christian in that time. He knew from the first period I went to him to satisfy his mind. But his heart was bitter. I felt his spirit like a viper. But the word of the Lord was verified at that time also. "When the Tempter raise a flood against you, I will set up a standard against him." He told me he had sent a letter to Pittsburg to stop me, although I had my Licence from the Bishop, with his own signature. I told him he was a worse enemy to me than I was aware of, and I was ashamed of him, professing to be a Preacher in charge, and setting such an example in a strange laud, and begged him to throw away his prejudices, or he would never obtain the Kingdom of Heaven. He left me in a flash, and I saw him no more until conference. I wrote a letter to bishop Allen to let him know of my grievances, as I was innocent of any crime. I felt under no obligation to bear the reproaches of progressing Preachers; and I wanted it settled at Conference. But it was looked upon with little effect by the Preachers and Leaders. I laid it before the Conference, and it was settled. But I tarried all winter. Preached, led Class, visited the sick, &&;c., with great success. I bless God for the witness of a good conscience. Old sinners were awakened, and constrained to come trembling, and enquiring the way to Zion. L. W., a respectable brother from Chillicothe, had never heard a woman preach, and was much opposed to it. An appointment was given me, and when I went into the desk and commenced reading the hymn to commence the worship, he looked at me a while, then got up and went out and stood until I had nearly got through the hymn, and then he came in, when I asked him to pray for us but he refused. I prayed myself, after which I took my text, and felt much liberty in speaking in the spirit indeed. And after meeting he came and shook hands with me in the spirit of a Christian, and next day he came and confessed to me his prejudices had been so great, so much like his father, that he could not unite with me, but now he believed that God, was no respecter of persons, and that a woman as well as a man, when called of God, had a right to preach. He afterwards became a licensed preacher, and we parted in peace. I took the stage and left for Chillicothe, but there was but one house that would open for me in the city, although I had my recommendation with me. As soon as that friend heard of me she met me in christian bonds, and her house was my home, her husband being a man of christian qualifications, and I went of my mission doing my Father's will. I spoke once in the week and on Sabbath afternoon, to crowded houses; it was like a camp-meeting, and twenty-one lay upon the power of God at one time; after preaching, we called them to be prayed for; some got religion that day and some on the next Sabbath, and the father L. W. became one of my best friends, and a doer of the work. There was large fields of labor open to my view, and I visited both colored and white, and many were concerned about sanctification. I was with them about six weeks, during which time I had an interview with a lady, who informed me she had a call to preach the everlasting gospel of Christ. She was a Presbyterian by profession, and she told me she feared the church government. But the greatest objection, was her husband was a Deist by profession; she also told me of her experience she passed through; it was a broken heart and a contrite spirit. God answers the prayers of such a supplicant, but she could not enjoy that sweet fulness of religion in that situation of life, although very rich as regards this world's goods; also knowing that gold and silver should vanish away, but the word of God should endure forever. And some feel their labors a long time before it comes to perfection. Out Methodist sisters established a prayer meeting, and the people worked in the unity of the spirit, and much good was done in the name of the Holy child. Glory to God for what my heart feels while I use my pen in hand. I felt peace of conscience and left Chilicothe for Hillsborough to meet a quarterly meeting of W.C., he being Elder at that place; the Governor and his family residing there, six in number, were all Methodists, and one sone a preacher; they had the spirit of christians. The trustee of the Methodist church opened their doors and gave us liberty to hold our quarterly meeting and love feast in their small donation, which was very thankful; after which I left there for Cincinnati, where I spoke to a large congregation. I stop't at Williamsport and spoke in the white Methodist church to a respectable congregation. I felt liberty in the spirit of God, and we left there about daybreak in the morning. All nature seemed in silence (except the chirping notes of a little bird.) A few rods from us a Panther screamed very loud and sudden, but we could not see him, it being a dense thicket on either side of the road, but the unseen arm of God sheltered us from harm; one of the gentlemen seemed quite used to hearing them. We arrived safe in Cincinnati about 11 o'clock; the Elder W.C. was very liberal in giving me appointments, and the friends were very affectionate to me, and largest congregations attended. I remained there some time, feeling to be blessed in my weak endeavors to a great extent. The next day after I arrived there, one of our sisters fell sick and I had the pleasure of visiting her on her death-bed and in her last hour she told me in presence of others, her peace was made, and raised her hands toward heaven and told us she was going. This is the end of sister Crosby; who can doubt this faithful saying; by grace ye are saved. A month or more previous, she had buried a daughter, who was a member of our church; before she left the world, she called her young companions and caused them to promise to meet her in heaven, and then closed her eyes triumphing in death. Brother Crosby laid the heavy task on me to preach their funeral sermons, which I did, as feeble a worm as I am, on Sabbath morning. Words of my choice were found in 2d Ephe. 8th v. - "For by grace ye are saved through faith, and that not of yourselves, it is the gift of God." Which of itself is a semon to all that believe - glory to God, Christ has overcome the world. And while laboring many tears were shed both in joy and sorrow. But it's better to be one day in the house of the Lord than a thousand in the tents of the wicked. Another circumstance worthy of notice, was a young man whose heart was in the world and in worldly affairs, or the pursuits of nature, and diverted much of his time on Sabbath days on the Mississippi River, fighting against all impressions of the Spirit of grace, until God stopped him by the heavy hand of his power, in a death-bed affliction. After some time he began to inquire the way to Zion. His mother was also a stranger to the blood of Jesus, but wished me to come and see her son; being conducted to the house, I found him looking like an anatomy. I asked him if he believed in Christ and his prayers with him and all sufficiency to save; is answer was in the affirmatives. We had prayers with him and there was a display of God's power; a white woman screamed and nearly felt to the floor, but strove hard to keep from it. And on that day he acknowledged his Saviour to be reconciled to his poor soul. Praise God! my soul replied. Afterwards he wished me to hold a meeting with as many persons as the room would contain with him, which I accepted; one day and night after, he departed this life, and requested me to preach his funeral sermon at the house before the procession moved to the ground. I spoke from the 14th chap. 13 v., and we had a solemn time; you may anticipate the weight of that important task, but we had joy in the midst of sorrow, and this was the last of James Thompson. I also left his sisters in the last stage of consumption, and she confessed to be in favour with the Lord. Having finished my visit, I left in steamboat for Dayton. I spoke three times, and tried to preach the whole salvation, God the Father, God the Son, and God the Holy Ghost. The members of the New-light church deny the divinity of Christ. Once I spoke in a large dwelling of Dr. Esley, after which himself and wife went on a journey to Indiana and wished me to go with them, but I was deprived by a previous engagement, having to attend a camp meeting at Cap-teen. After my return to Urbanna, Ohio, I took stage for Springfield, and from there to Columbus, and spoke several times. The Elder's class consisted of about twenty; a young man and myself led the class in 1829. The Elder W.C. ordered a camp-meeting for the Cincinnati people, and the brother at Cap-teen and Rev. Bishop Brown, held a conference, and we had a very large camp-meeting, and manifestations of great good, and at the close of the Love-feast, there were thirty-two or three testified that they experienced the love of God. The people of color came out forcibly, and the preachers preached in power. My health was much destroyed by speaking so often and laboring so very hard, having a heavy fever preying upon my system. I was called upon to speak at a camp-meeting, I could scarcely accomplish the task, and I was obliged to take my bed (having also lost my appetite) as soon as my sermon was over. After a while my particular friends conveyed me to Mount Pleasant in a carriage; the day was pleasant, but in the woods at night we were overtaken by a dreadful storm of thunder, wind and rain, but through the will of Providence I escaped the inclemency of the weather and stopped at brother and sister Hance's; after being medically renovated, I fulfilled an appointment, and commenced to visit the sick in that place, but was arrested by a heavy fever... When I was able to travel, one of the preacher's wives and a kind brother conducted me on to Washington, from which I took stage for Mount Pleasant; labored for them, enjoyed a love-feast with them, and in a few days left for St. Clairsville and the next successive place; then took stage for Zanesville, continuing to labor around the circuit, and then went to Columbus. I was invited to attend a quarterly meeting at Urbana; we had quite a profitable waiting upon the Lord; it makes me glad when they say let us go up to the house of the Lord. After trying to rest myself four or five weeks, a brother preacher, in company with brother Steward's widow and myself, visited the Indians, she having lived nine years in Sandusky. We heard them preach in their own language, but I could only understand when he said Jesus Christ of God, and the interpreter had gone to conference. I spoke to them in English, was entertained in an Indian family, and that very kindly after which I shook the dust off my feet and left them in peace. Thank the Lord for Urbana. The Elder appointed a camp meetings at Hillsborough; it was nothing to boast off; after which I turned towards Philadelphia. Brother Rains paid my stage fare on to Springfield; from thence endeavored to speak to a small and very quiet congregation; from thence to Columbus and paid seven dollars and a half, and left for Wheeling.